The first option was for the maiden girl to go up to the castle and live with the king. However, if this happened, she would always have in the back of her mind where she came from and how she was not worthy to live with him because she was not royalty. This would "eat her up inside". Then, how could she love him back? She couldn't! The second option was for the king to come down from the palace with all his kingship and glory, in order to marry her. This couldn't happen, though, because then that would be to the glory of him because the village people would think how wonderful the king was for coming down in all of his pomp and circumstance. Everyone, including the maiden, would be looking at the king and his glory, not realizing he came for the love of the maiden. All the glory would be on the king and not on the maiden whom he loved. The third option was for the king to give up everything! All his kingship, glory, power, etc., come down and live with her, without living as a king in this world for that would give glory to their love. That's what the king wanted and was willing to do. This is the story of Jesus Christ. In John 3:16, we read "God so loved the world that He gave His only begotten Son, that whoever believes in Him shall not perish, but have eternal life". Christ did not have to come down to our world. He freely came out of His great love for us. He emptied Himself of His Glory, and was born in a manger, was tortured and crucified on a cross, in order to bridge the "gap" between the human and divine. Christ came to serve, not to be served. The Bridegroom came for his bride. Q: Why did Christ freely want to come down? A: Because of His love for us. Because He wanted us to know that we are loved by Him. He wanted us to love Him back freely. The love saves us and offers us eternal life. Q: On Palm Sunday, how did Christ enter Jerusalem? A: He came on a donkey, expressing a peaceful entry. He didn't come on big white horse, showing His Lordship with an army surrounding Him. He came on a simple, peaceful donkey -- the way people like us would have traveled back then. This is how He came to enter our hearts. Q: How did the people respond to Him? A: With great joy and love. They didn't feel threatened or fear. The people didn't feel like they had to become the King's slaves. But rather, they had a choice to worship, welcome and follow Him freely. Jesus Christ is our King. He came on Palm Sunday as the King of Glory. He came in peace, to teach us the Glory of peace. He came in humility, to model for us the Glory of humility. He came in love, to embrace every human being. He came to suffer and die on the Cross, to open the Gates of Paradise forever. Even though our Lord came into the world like this, some people still hated Him, mocked Him and rejected Him -- and chose their own way. Session II is more of a hands on session. These various scenes are designed to be approximately 10-15 minutes each. The focus of each of these segments is to bring the retreatant to the various scenes of Christ's final days upon the earth as well as His Glorious Resurrection. For each scene, there is a "materials needed list." It would be best if you can obtain every item listed. However, if you can only obtain some of the items, that is fine. Set up six small tables around the Church or hall. Travel with the group to each table. At each of the scenes, have a retreatant read the bible pericope slowly and prayerfully. Once the pericope has been read and understood by all, take each piece from the material list and explain its significance. All instructions on what you may do at each scene are typed in italics next to the items needed. Obviously, there is much more than can be discussed about these days. However, we wanted to focus on a few key points that will familiarize the retreatants with the material. At the end of each scene allow the retreatants a few minutes of silence to reflect on the scene. You can provide paper to give them the opportunity to write down their thoughts (be sure to stress they are writing for themselves and what they write will not be collected). (if time allows, you may wish to wash each other's feet). Jesus, knowing that the Father had given all things into His hands, and that He had come from God and was going to God, rose from supper, laid aside His garments, and girded Himself with a towel. Then He poured water into a basin, and began to wash the disciples' feet, and to wipe them with the towel with which He was girded. He came to Simon Peter; and Peter said to Him, "Lord, do you wash my feet?" Jesus answered him, "What I am doing you do not know now, but afterward you will understand." Peter said to Him, "You shall never wash my feet." Jesus answered him, "If I do not wash you, you have no part in me." Simon Peter said to Him, "Lord, not my feet only but also my hands and my head!" Jesus said to him, "He who has bathed does not need to wash, except for his feet, but he is clean all over; and you are clean, but not every one of you." For He knew who was to betray Him; that was why He said, "You are not all clean." When He had washed their feet, and taken His garments, and resumed His place, He said to them, "Do you know what I have done to you. You call me Teacher and Lord; and you are right, for so I am. If I then, your Lord and Teacher, have washed your feet, you also ought to wash one another's feet. For I have given you an example, that you also should do as I have done to you, truly, I say to you, a servant is not greater than his master; nor is he who is sent greater than he who sent him. If you know these things, blessed are you if you do them. Question: Why did the Lord wash the Disciples feet? Answer: To prepare the Disciples for the Eucharist. Christ shows us that He Himself washes and cleanses us. Christ also shows us His humility. Q: Why did Simon Peter not want his feet to be washed by the Lord? A: He felt it was beneath the Lord -- that the Lord of all should not lower Himself to wash the dirtiest part of a human being -- the feet. Q: How did the Lord respond to this? A: "If I do not wash you, you have no part in me." Q: How did Simon Peter respond to these words? A: "Lord, not my feet only but also my hands and my head!" These words should be our response to Jesus in the Sacraments of Holy Confession and Communion. ". . . and as they were eating, He said, "Truly, I say to you, one of you will betray me." And they were very sorrowful, and began to say to Him one after another, "Is it I, Lord?" He answered, "He who has dipped his hand in the dish with me, will betray me. The Son of man goes as it is written of Him, but woe to that man by whom the Son of man is betrayed! It would have been better for that man if he had not been born." Judas, who betrayed Him, said, "Is it I, Master?" He said to him, "You have said so." Question: Why did Jesus say that one of them would betray Him?Answer: Even though Jesus knew that Judas, one of His closest friends, would betray Him, He still offers cleansing and will offer him His Body and Blood. Now as they were eating, Jesus took bread, and blessed, and broke it, and gave it to the disciples and said, "Take, eat; this is my body." And He took a cup, and when He had given thanks He gave it to them, saying, "Drink of it, all of you; for this is my blood of the covenant, which is poured out for many for the remission of sins. I tell you I shall not drink again of this fruit of the vine until that day when I drink it new with you in my Father's kingdom." Almost 2,000 years after the first Communion, we still receive the same Body and Blood of our Lord at each and every Divine Liturgy. We do this to partake of our Lord and also to remember our Lord's saving actions on the Cross and in His Glorious Resurrection. Before the Consecration of the Gifts at the Divine Liturgy, the Priest reads the prayer: "Remembering therefore this command of the Savior and all that He had done for us, the Cross, the tomb, the resurrection on the third day, the ascension into heaven, the enthronement at the right hand of the Father and His second and glorious coming again." Allow time for the retreatants to reflect before moving onto the next scene. Then Jesus went with them to a place called Gethsemane, and He said to His disciples, "Sit here, while I go yonder and pray." And taking with Him Peter and the two sons of Zebedee, He began to be sorrowful and troubled. Then He said to them, "My soul is very sorrowful, even to death; remain here, and watch with me." And going a little farther He fell on His face and prayed, "My Father, if it be possible, let this cup pass from me; nevertheless, not as I will, but as You wilt." Then an angel appeared to Him from Heaven strengthening Him. And being in agony, He prayed the more earnestly. Then His sweat became like great drops of blood falling down to the ground. When He rose up from prayer, and had come to His disciples, He found them sleeping from sorrow. And He came to the disciples and found them sleeping; and He said to Peter, "So, could you not watch with me one hour? Watch and pray that you may not enter into temptation; the spirit indeed is willing, but the flesh is weak." Again, for the second time, /he went away and prayed, "My Father, if this cannot pass unless I drink it, Your will be done." And again he came and found them sleeping, for their eyes were heavy. So, leaving them again, He went away and prayed for the third time, saying the same words. Then He came to the disciples and said to them, "Are you still sleeping and taking your rest? Behold, the hour is at hand, and the Son of man is betrayed into the hands of sinners. Rise, let us be going; see, my betrayer is at hand." Question: How does Jesus show His humanity? Answer: By asking, "My Father, if it be possible, let this cup pass from me; nevertheless, not as I will, but as thou wilt." Q: What happened when Jesus asked His Disciples to pray with Him? A:They fell asleep. While He was still speaking, Judas came, one of the twelve, and with him a great crowd with swords and clubs, from the chief priests and the elders of the people. Now the betrayer had given them a sign, saying, "The one I shall kiss is the man; seize Him." And he came up to Jesus at once and said, "Hail, Master!" And he kissed Him. Jesus said to him, "Friend, why are you here?" Then they came up and laid hands on Jesus and seized Him. And behold, one of those who were with Jesus stretched out his hand and drew his sword, and struck the slave of the high priest, and cut off his ear. Then Jesus said to him, "Put your sword back into its place; for all who take the sword will perish by the sword. Do you think that I cannot appeal to my Father, and He will at once send me more than twelve legions of angels? But how then should the scriptures be fulfilled, that it must be so?" Question: Was Christ in control of the situation in the Garden, or was He a victim? Answer: Christ was in control. At any time, He could have asked His Father to send "more than twelve legions of angels to save Him. But He wanted to fulfill the Old Testament Scriptures for the Salvation of All. Q: Why did Judas betray Christ? A: For thirty pieces of silver. And the soldiers led Him away inside the palace (that is, the praetorium); and they called together the whole battalion. And they clothed Him in a purple cloak, and plaiting a crown of thorns they put it on Him. And they began to salute Him, "Hail, King of the Jews!" And they struck His head with a reed, and spat upon Him, and they knelt down in homage to Him. So Jesus came out, wearing the crown of thorns and the purple robe. Pilate said to them, "Behold the man!" When the chief priests and the officers saw Him, they cried out, "Crucify Him, crucify Him!" Pilate said to them, "Take Him yourselves and crucify Him, for I find no crime in Him." The Jews answered Him, "We have a law, and by that law He ought to die, because He has made Himself the Son of God." Now it was the day of Preparation of the Passover; it was about the sixth hour. He said to the Jews, "Behold your King!" They cried out, "Away with Him, away with Him, crucify Him!" Pilate said to them, "Shall I crucify your King?" The chief priests answered, "We have no king but Caesar." Then he handed Him over to them to be crucified. Q: How did they mock Christ? A: Purple cloak - making fun of the fact that He is King. Crown of thorns -- a King's crown. Q: What was Pilate's response to chief priests and officers when they said, "Crucify him, crucify him?" A: "Take him yourselves and crucify him, for I find no crime in him." And when they came to the place which is called The Skull, there they crucified Him, and the criminals, one on the right and one on the left. And Jesus said, "Father, forgive them; for they know not what they do." And they cast lots to divide His garments. And the people stood by, watching; but the rulers scoffed at Him, saying, "He saved others; let Him save Himself, if He is the Son of God, His Chosen One!" The soldiers also mocked Him, coming up and offering Him vinegar, and saying, "If you are the King of the Jews, save yourself!" There was also an inscription over Him, "This is the King of the Jews." One of the criminals who were hanged railed at Him, saying, "Are you not the Christ? Save yourself and us!" But the other rebuked him, saying, "Do you not fear God, since you are under the same sentence of condemnation? And we indeed justly; for we are receiving the due reward of our deeds; but this man has done nothing wrong." And he said, "Jesus, remember me when you come into your kingdom." And He said to him, "Truly, I say to you, today you will be with me in Paradise." It was now about the sixth hour, and there was darkness over the whole land until the ninth hour, while the sun's light failed; and the curtain of the temple was torn in two. Question: How did Jesus respond to those who were killing Him?Answer: "Father, forgive them; for they know not what they do"
Q: Could you do the same? Q: If you were on the Cross next to Christ, which thief would you be like? Q: Who was the first human to go to heaven after Christ resurrected and why? A: The thief on the right. He said to Jesus, "Jesus, remember me when you come into your Kingdom." And Jesus said to him, "Truly, I say to you, today you will be with me in Paradise." And about the ninth hour Jesus cried with a loud voice, "Eli, Eli, la'ma sabach-tha'ni?" that is, "My God, my God, why have thou forsaken me?" And some of the bystanders hearing it said, "This man is calling Elijah." And one of them at once ran and took a sponge, filled it with vinegar, and put it on a reed, and gave it to Him to drink. the others said, "Wait, let us see whether Elijah will come to save Him." And Jesus cried again with a loud voice and yielded up His spirit. 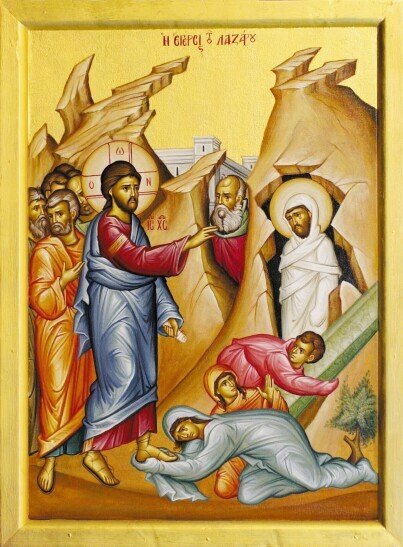 And behold, the curtain of the temple was torn in two, from top to bottom; and the earth shook, and the rocks were split; the tombs also were opened, and many bodies of the saints who had fallen asleep were raised, and coming out of the tombs after his resurrection they went into the holy city and appeared to many. When the centurion and those who were with Him, keeping watch over Jesus, saw the earthquake and what took place, they were filled with awe, and said, "Truly this was the Son of God!" Read (Have Retreatant read the pericope slowly and prayerfully). Joseph of Arimathea, a respected member of the council, who was also himself looking for the kingdom of God, took courage and went to Pilate, and asked for the body of Jesus. And Pilate wondered if He were already dead; and summoning the centurion, he asked him whether He was already dead. And when he learned from the centurion that He was dead, he granted the body to Joseph. And he bought a linen shroud, and taking Him down, wrapped Him in the linen shroud, and laid Him in a tomb which had been hewn out of the rock; and he rolled a stone against the door of the tomb. Mary Magdalene and Mary the mother of Joses saw where He was laid. Question: What does it mean that Joseph was "a respected member of the council"? Answer: He was there when they condemned Jesus to death. Q: Why did Joseph ask for the body? A: How do you think Joseph of Arimathea must have felt asking for Jesus' body? By asking Pilate for the body of Jesus, it must have taken alot of courage. Joseph was among the men who condemned Jesus, and now he has decided to be among Jesus' followers. What courage he showed forth. It is this same courage that we need to have as Christians living in this society. Q: Why do we carry outside the Church on Holy Friday evening? A: The procession around the Church represents Christ's descent into Hades. We the faithful with our candles follow Him. Q: Why do we walk under the Kouvouklion with our candles as we enter the Church after the procession? A: We are symbolically expressing the belief that we have already passed from death to life with our Savior. Now after the sabbath, toward the dawn of the first day of the week, Mary Magdalene and the other Mary went to see the sepulchre. And behold, there was a great earthquake; for an angel of the Lord descended from heaven and came and rolled back the stone, and sat upon it. His appearance was like lightning, and his raiment white as snow. And for fear of him the guards trembled and became like dead men. But the angel said to the women, "Do not be afraid; for I know that you seek Jesus who was crucified. He is not here; for He has risen, as He said. Come, see the place where He lay. Then go quickly and tell His disciples that He has risen from the dead, and behold, He is going before you to Galilee; there you will see Him. Lo, I have told you." So they departed quickly from the tomb with fear and great joy, and ran to tell His disciples. And behold, Jesus met them and said, "Hail!" And they came up and took hold of His feet and worshipped Him. Then Jesus said to them, "Do not be afraid; go and tell my brethren to go to Galilee, and there they will see me." Now the eleven disciples went to Galilee, to the mountain to which Jesus had directed them. And when they saw Him they worshipped Him; but some doubted. And Jesus came and said to them, "All authority in heaven and on earth has been given to me. Go therefore and make disciples of all nations, baptizing them in the name of the Father and of the Son and of the Holy Spirit, teaching them to observe all that I have commanded you; and lo, I am with you always, to the close of the age." Question: What did Jesus do after He resurrected? Answer: He appeared on numerous occasions to His Disciples, His seventy and five hundred followers for forty days. Q: What happened on the fortieth day after the Resurrection? A: Christ ascended into Heaven in Glory and sat at the right hand of the Father. Q: When and what is Pentecost? A: Fifty days after Christ's resurrection, the Father sent the Holy Spirit and descended on the Disciples. This is the birthday of our Church. Jesus Christ, the Son of God, King of All ages, died and resurrected for our Salvation. At the end of the scriptural passage above, Christ gives His Disciples and us a promise: "and lo, I am with you always, to the close of the age."